Q: On January 15, the British House of Commons rejected the Brexit deal and the political declaration which sets out a framework for the future UK-EU relationship by a vote of 432 to 202. On the same day, the opposition Labour Party introduced a motion of no confidence on the government. What is your comment? A: China has been closely following the Brexit issue and noted that there are some disagreements within the UK and between the UK and the EU on this issue. We believe that when the UK and the EU enjoy stability, openness and development, all parties stand to benefit. We hope that the Brexit process would proceed in a steady and orderly way. China's existing policy in moving forward the development of China-UK and China-EU relations in parallel will not change. As for the motion of no confidence on the government introduced by the opposition party, it is their domestic affair and the Chinese side will not comment on that. Q: After the Canadian Robert Lloyd Schellenberg was sentenced to death by the Dalian Intermediate People's Court, Canadian leader said China has "arbitrarily" applied the death penalty. Canadian Foreign Minister Chrystia Freeland described the death penalty as inhumane and inappropriate. But we also noted that there are Canadian media reports that Schellenberg was convicted of drug possession and trafficking by courts in Canada as early as 2003 and 2012. In the meantime, some Canadian netizens also believe that smuggling over 200kg of methamphetamine is a felony and the Canadian government should not provoke diplomatic issues for such a vile drug trafficker. What's your comment? A: I also noted relevant reports. What you mentioned in your question seems to imply that some Canadians are even more sensible than their leader. I wonder if the leader of the Canadian side can make it clear to its people how many lives 222kg of drugs could claim and how many families could be robbed of their happiness? If Schellenberg's sentence to death for smuggling 222kg of drugs is inhumane and inappropriate, does that mean it's humane and appropriate to allow drugs to deprive more people's lives? The severe harm of drugs following the Opium War in 1840 is still very much alive in Chinese people's memory and we will never allow drug traffickers of other countries to put the lives of Chinese people in jeopardy. If this case of Schellenberg's drug smuggling happens in Canada, we wouldn't even care how the Canadian side handles it. But since this case has happened in China, it needs to be handled in accordance with Chinese law. Just as the opinion of some Canadians you mentioned suggests, Chinese judiciary's conviction is just, while the relevant remarks of the Canadian leader is apparently somewhat arbitrary and would taint the image and reputation of Canada. We hope that they will respect the rule of law and China's judicial sovereignty. Q: Bloomberg had a report saying that some Chinese state-owned enterprises have been asked to avoid business trips to the US and its other allied countries and to take extra precautions to protect their electronic devices if they need to travel there. What is China's comment? A: I am not aware of the specific details you mentioned. But from a series of reports we've seen, some countries do take some measures which I believe are not very fair or even improper in regulating the entry of Chinese citizens. Under this circumstance, if there is indeed such a warning, I believe it is appropriate. Q: The Canadian Foreign Ministryhas asked China to consider "clemency" for Robert Schellenberg. Will the Chinese side listen to the request from the Canadian side and consider sparing his life? A: You asked whether China would like to listen to the request from the Canadian side, but I would like to ask relevant Canadian leaders whether they have truly and earnestly listened to China's solemn position? We have made clear the facts, circumstances and gravity of this case. You all know that drug crime is a world-recognized felony with great harm to the society. All countries crack down on it severely. The real spirit of the rule-of-law indicates that everyone is equal before the law. Canada has been repeating that it is a law-abiding country. We hope that it could earnestly take some concrete actions to show its respect for the rule of law. Follow-up: But with respect to the specific request for "clemency" that death is not applied in the situation, will the Chinese side accept this request by the Canadian side? A: China is a country governed by law. In accordance with the provisions of the Constitution, the people's courts and the people's procuratorates shall independently exercise the judicial and procuratorial powers respectively in accordance with the provisions of the law, free from any interference from administrative organs. Q: As we have learned, DPRK official Kim Yong Chol will be in Beijing tomorrow on his way to the US. Can you confirm that? Will he meet with Chinese officials while he is in Beijing? A: My understanding is that he will transit in Beijing. As of yet, I haven't heard of any arrangements for meetings. Q: The Canadian Prime Minister yesterday spoke out about what he called "arbitrary" law enforcement in China. 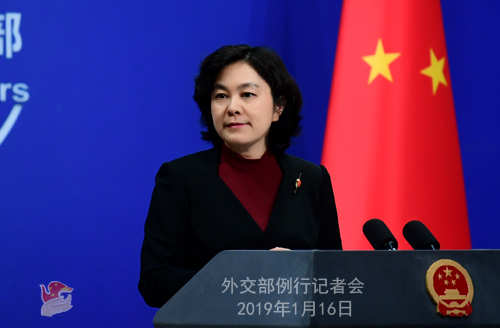 The Australian Acting Foreign Minister has recently also spoken out on that, saying that the death penalty should not be applied in Schellenberg's case, and also China should not reach a verdict so rapidly. Is the Chinese side concerned that it is facing opposition from the international community? A: I can tell you for sure that we are not worried at all. You mentioned Australia in your question. Actually, you can count by the fingers of your hand the few allies of Canada that chose to side with it on this issue. These several countries can by no means represent the entire international community. For serious crimes posing great harm to the society like drug-smuggling, I believe it is the international consensus that such crimes shall be strictly handled and punished. As a Canadian media outlet, you should know that people in Canada share this view. They also demand their government to severely crack down on these crimes, because that is what should be done to cherish, respect and protect people's lives. As for the statement made by the relevant Australian officials on China's handling of the Schellenberg case, I find it rather odd. Does it have anything to do with Australia? According to the information released by the relevant Chinese court, Schellenberg was planning to smuggle more than 200kg of drugs to Australia. Does the Australian side wish to see this large batch of drugs arrive in its land and endanger its people? This Australian official owe an explanation to his people. Does he wish to see these drugs find their way into his country? I have made clear China's unequivocal position at yesterday's press conference. It is highly irresponsible of the Canadian leader to use "arbitrary" to describe China's trial of the Schellenberg case. In fact, the relevant remarks made by the Canadian leader, which lacks the minimal spirit of the rule of law, showcased what arbitrary means. I also suggest you give another read to the interview of the official from the Dalian Intermediate People's Court. In the handling of the Schellenberg case, the Chinese side has strictly followed the provisions of the Criminal Procedure Law and went through relevant legal procedures. Nothing procedure-wise has deviated from the law. When hearing the Schellenberg case, the Dalian Intermediate People's court has ensured the right of the defendant's lawyer to review the case files. All links in the trial met the term-related provisions of the Criminal Procedure Law, including case filing, formation of the collegial panel, serving of the summons and notices and the notification of the time and place of the court session. Q: There have been a number of reports that Chinese Vice Premier Liu He will be visiting Washington on January 30 and 31 to continue the trade talks with the US. Can you confirm that? A: The Spokesperson for the Commerce Ministry has talked about the next-step arrangements for China-US trade talks many times. The two sides are now in close communication. One thing is clear, which is that the two sides are making positive efforts to implement the important consensus reached between the two leaders and reach an agreement that is mutually beneficial and win-win through trade negotiations and consultations. Q: The Defense Intelligence Agency of the US issued a report on China's military power, saying that Beijing's attempt to "eventually compel Taiwan's reunification with the mainland" has served as the primary driver for China's military modernization. China is rapidly building a robust, lethal force, with capabilities spanning ground, air, maritime, space and information domains, designed to enable China to impose its will in the region, and beyond. What is your comment? These reports by the US side made unwarranted speculations and comments on China's development path, strategic intention and national defense, showing no respect to facts and teeming with the Cold War mindset and zero-sum game mentality. The baseless speculations they contain are highly ridiculous and unprofessional. China is firmly opposed to that. We believe that the sound and steady development of military ties between the two sides will benefit not only the two countries but also the whole world. We hope that the US military could view China's development in a rational, objective and correct way and maintain the larger picture of China-US state-to-state and mil-to-mil relations with concrete actions. First, China is committed to the path of peaceful development. 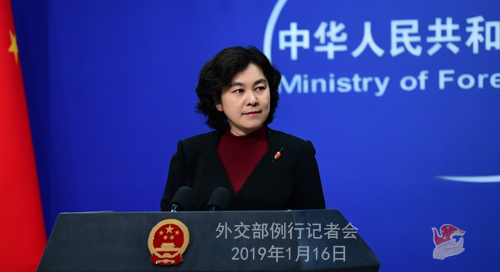 China develops its national defense strength independently in commensurate with the growth of its national power, the purpose of which is to better safeguard its own sovereignty, security and development interests and maintain global and regional peace and stability. Second, China is a role model in observing regional and international rules. We maintain that interests shall be protected by rules, not by weapons. In fact, as you may have all noted, even for a country as militarily powerful as the US, it cannot have its way in everything it does. We hope that the US side could also respect and observe international rules, instead of finding or even fabricating various excuses to develop greater lethal force for the purpose of more military strength. 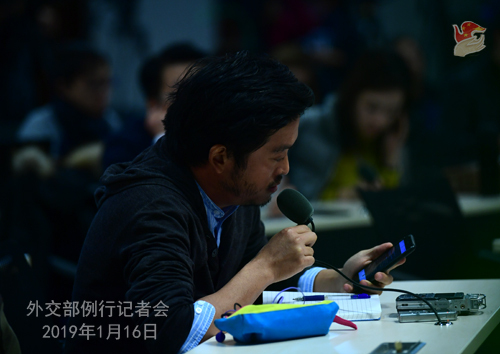 Third, the Taiwan question belongs to China's internal affairs. Just like what General Secretary Xi Jinping said in his speech to commemorate the 40th anniversary of issuing Message to Compatriots in Taiwan, we are willing to create broad space for peaceful reunification, strive for peaceful reunification with utmost sincerity and greatest efforts, but will leave no room for any form of separatist activities. We urge the US to abide by the one China policy and maintain the larger picture of China-US relations as well the peace and stability across the Taiwan Straits. Fourth, I also want to remind certain people in the US that peace and development is the trend of the times and the aspiration of all people. If these people only care about burying their heads down to find traps or are even busy digging pits, instead of looking up at the stars, sooner or later they will fall into the traps and pits of their own making.